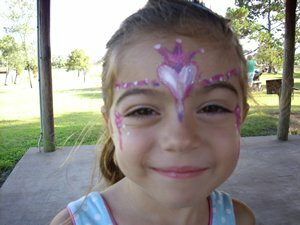 Orlando Princess Face Painting for Girls 3 - 6 yrs old. Little girls will sparkle with colorful designs that delight the imagination. Your child and her guests will be transformed into princesses with talented brush strokes, sparkles and gem stones. Stories of magical lands and places enhance the experience of feeling special as your child becomes princess for a day. For the fun to begin make your reservation today!